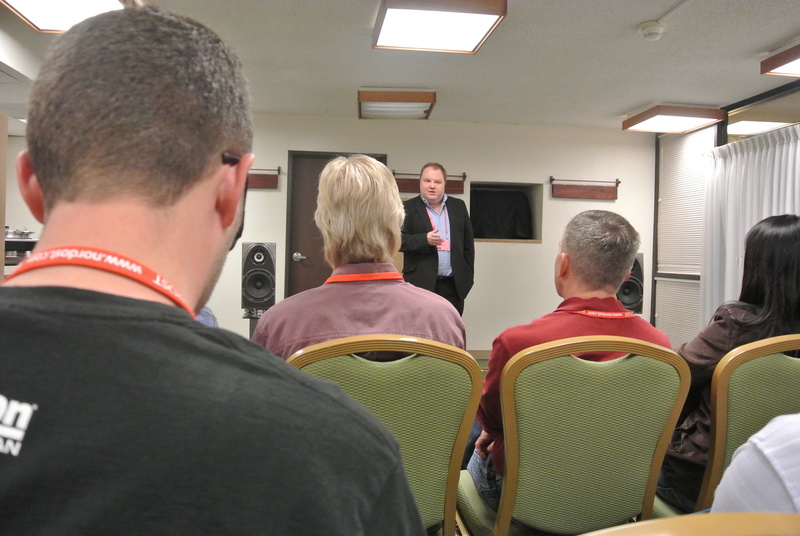 Alan Sircom, Editor-in-Chief of Hi-Fi Plus, gave a lecture regarding a topic that many audiophiles are already familiar with – using “loudness” to compensate for compression. He began by reminding us that some artists use compression selectively for artistic purposes, like a wah-wah pedal or a mute on a trumpet, so it’s not always something that should have us running for the hills. The trouble tends to lie with recording technology that dawned during the 1980s. Sircom played well-known pieces of music from the 1920’s up through now, explaining that older recording technology allows audio tracks the ability to showcase a range of emotion within the same piece – a rollicking piano combined with a breathy trumpet or a pounding drum mixed with a twinkling of chimes. It’s hard to disagree with his logic. What I found most striking is that he played six or seven tracks from various eras all without manually changing the volume setting. The most recent, “Uprising” by Muse, seemed to blow us out of the room! I wanted to cover my ears despite actually liking that song. Now, is that the fault of the recording technology and the mass market the music industry caters to, or is more the fault of the recording engineer? That’s debatable, though I’m sure folks from either side carry strong opinions in their back pocket. Perhaps unfairly, it is clear that it’s the audiophile’s responsibility to spend time with his system and work with it until a better balance is achieved. What do you think, Members? Let us know in the comments below!